Kansas means BIG BUCKS!! With a tremendous gene pool developed over the past years by limiting the number of Big Bucks hunted and harvested we have been able to offer hunts for deer that have scored 150 to the high 190's. Each year it seems the deer are bigger than the year before. Reports show there are still deer in the 190's still "walking the line". The past season was very successful for the hunters. 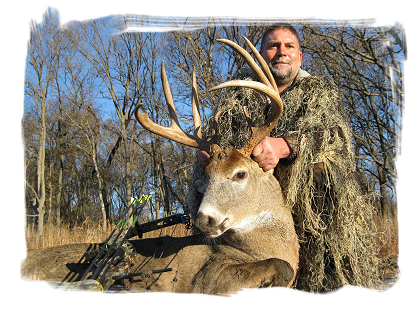 We offer both Archery and Black Powder and rifle season hunts. Cokeley Farms requires a payment in full at the time of booking the hunt. Talk to Will about the chance to take a BIG BUCK. Due to very dry conditions the past two years, we have made the decision to further limit hunting, at least for the next year or two. But, this may change if conditions warrant, so feel free to call us.